One major annoyance of buying apps and games through most app stores for mobile, smartphone or tablet devices are that there is no trial or evaluation version been provided. As a result, buying a mobile app is similar to buying a lottery. If you’re lucky, you will get an app that does what you want it to do. Unlucky, you will end up with crappy, buggy, boring games or some useless apps that do not serve buyer’s purpose. To make matter worse, there is no easy way to return the apps or games purchased to get a refund. Even though they’re reviews and ratings for popular apps which consumers can refer to, but its accuracy, reliability and trustworthy can be in doubt sometime. The best bet is to download the free or ad-support versions, and that’s if they’re offered, where most lower quality apps not usually do. 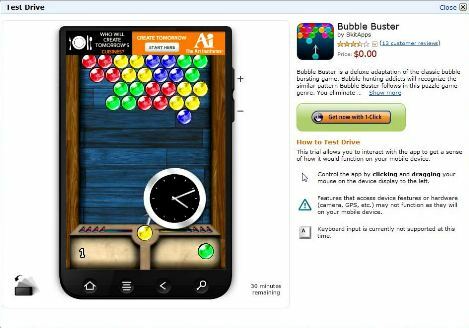 With the launch of Amazon Appstore for Android, now mobile apps or games purchasers can actually test drive or try out the apps or games prior to paying cool hard cash to buy the app. The “Test Drive Before You Buy” feature of Amazon Appstore is currently available for Amazon customers in the US. In order to test drive an app, just visit the Amazon Appstore to view any app, or locate the “Test Drive Before You Buy” section located on the sidebar to the right. A random app will be displayed directly for test drive, or else just click on the Test Drive other apps (aff) link to some favorites apps that available for virtual usage. If an app is available for test drive, a green “TEST DRIVE NOW instantly on your computer” will be displayed below the price on the individual app page. Note that if you’re visiting the Amazon Appstore from outside of United States, or you’re not logging into Amazon account, you won’t be shown the Test Drive Now button. 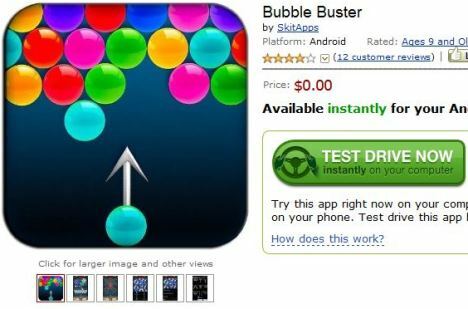 Once you click on the Test Drive Now button, an overlay will load a virtual Android mobile phone emulator to run the app. User can then actually use or interact with the app or play the game in order to get a sense on how the app will function on the mobile device, though instead of finger, mouse drags and clicks will replace finger taps and gestures, and keyboard input, GPS, camera or other hardware components are not supported. The test drive feature of Amazon Appstore is available for both free and paid apps, albeit for free apps one can always download and install, then remove if they don’t satisfy the need. But it can also be interpreted as the test drive function will finally be available for most if not all apps distributed on the Amazon Appstore.